Welcome to BaseCode, a program made in Scratch that adds in programming via text, and makes modding it incredibly easy. The 1 means that you want to set line one of the text to HELLO WORD. Unfortunately, it only supports capital letters, making it similar to programming languages such as BASIC (it also lacks brackets, double-quotes, exclamation points, and some relatively important characters that will be fixed in the future). There's also an option for READ. It's N. This will READ the text with Numbers beside it, for each line. To use an option, just include it in your command. Now, you might have been using it for a while, and then you'd get a big screen full of text. You press one more enter, and then.. it just stops. It makes a beep noise and stops responding. This is because your PREF for PAGEPAUSE is 1. (Let me translate that. You have a preference called page pause that is defaulted at 1.) PAGEPAUSE is a preference that will pause the system when your page fills up; all you need to do is press space to resume. This is to give you a chance to read what you write. To turn it off, just write PREF PAGEPAUSE. BaseCode is also a coding tool; that's what it was meant for originally. It was based off of DOS and BASIC, so it has some similar commands. For example, ECHO will echo whatever you typed in to the console. So if you type ECHO HELLO WORD., it will display HELLO WORD. to the console. 2 ECHO I LIKE THIS PROGRAM. I WONDER IF YOU DO? 3 ECHO I'M GOING TO CLEAR THE SCREEN. Look at what comes out! Can you see how this might come in handy? 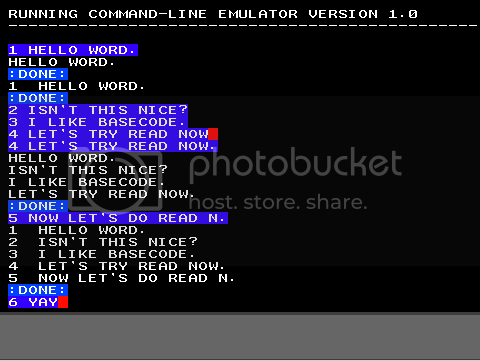 There aren't very many commands (write cmds to see them all) in the unmodified version of BaseCode, but after all, it's made for modding! 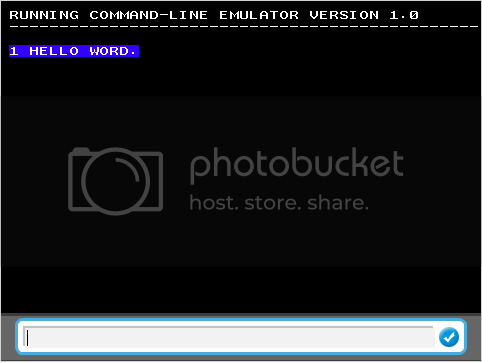 See the developers guide for information on making your own commands. Why don't you upload it to the website? Also you should make it not case-sensitive. I probably will, in the final (or a future) version.